At Fargo…mercury 47’ below zero and a hurricane blowing….At Neche, Dak. the thermometer is 58’ below zero. “By forming in parties of ten each, taking a long rope and marching across the prairie in line of that the villagers today found all the lost school children except one, a child of 10, named Johnson. Search still continues tonight, but as the mercury is 10’ below there is little hope of finding the child alive. A little boy named Wexel Beck started for his home from school about 3 o’clock yesterday afternoon and has not been heard of since. Another little boy named George Allen started from school for his home on the Military Road, about a mile west of the city limits about the same time. He did not reach home, and all efforts to find him have been unsuccessful. Children Perish. Garrison, Neb., Jan. 13. Special Telegram – Three children of John Denlinger, who attempted to go home from school during the storm yesterday, lost their way and remained out all night; when they were found this morning one was frozen to death, the other two may recover. Two Little Victims. Canton, D.T. Jan. 13. Two children of Mr. Fitzgerald, at Inwood, Iowa, were caught in the blizzard while going home from school and perished. Rolland Chambers, who lived 6 miles from here, started for the school house, a mile away, for his son. Both got lost while returning home. The father was frozen to death and the son is so badly frozen that he may die. The Washington Critic also includes an account that combines the tribulation experienced by many schoolchildren with another group that suffered even greater losses. Terribly Frozen. Redfield, Dak., Jan 14. A son of Henry Older, a farmer, living ten miles northwest of here, started out Thursday morning with a team to take four of his younger brothers and sisters to school. He reached the school house with his load and had started home, when the storm struck him. He started back to the school house to get the children. The two elder ones expressed a desire to remain. The others started home with the young man. They had not gone far when they lost their way and finally unhitched the team and covered themselves up with robes and lay down in the sleigh. There they remained twenty-six hours, until they were discovered yesterday morning, all three being terribly frozen and almost dead. Their chances of life are very small. One of the horses was dead when found. Thomas Gilkerson, who keeps a dairy two miles from Huron, went with Otto Gose to get a load of hay. They got lost, tied their horses to the wagon, started to find the house, and got separated. Gose reached the house terribly frozen but Gilkerson has not been found. Raymond, Dak., Jan. 13. Damage to livestock will be great while reports of suffering and death are constantly coming in. Two sons of William Driver were frozen to death within a few feet of their barn. Charles Heath is missing and J.H. Clapp has been discovered badly frozen, he having been out all night wandering upon the prairie. The elevator of Archer & Howe has gone down with 13,000 bushels of grain. Other minor casualties are reported. Minot, Dak., Jan. 13. No trains are moving yet. The storm has abated but the wind is still blowing. It was 38 below zero this morning….James Smith and two sons, aged 15 and 17, started for a load of hay six miles from town on the 11th and have not since been heard from. Search parties are out today. Several other persons are missing. Adrian, Minn., Jan. 13. Several farmers living twelve to fifteen miles north started home from here about 3 o’clock yesterday and have not yet been heard from. John Doring Camper, a farmer living a mile north of here, was at a neighbor’s a quarter of a mile away, started home, and was lost. Some fifty villagers started out to find him to-day but so far have not done so. The storm is still raging. The shop whistle has been blowing at intervals during the afternoon as an assistance to persons out in the storm….Business men who attempted to go home this afternoon lost their way at the street crossings. Many others are not attempting to go home tonight. Graham P. Browne, a wealthy fine stock raiser, living in the suburbs, went to Council Bluffs with a sleighing party yesterday, accompanied by a young lady. On the way back the team ran away, throwing them out in the storm. They lost each other and the young lady has not been heard from since. Bismarck, D.T., Jan. 13. A stage left Washburn, a place fifty miles northwest of here, for this city, yesterday morning, and should have arrived here last evening, but nothing has as yet been heard of it. It is supposed it is lost in the blizzard. Hunters out in the Storm. Paxton, Neb., Jan. 13. Special Telegram – George W. Post, lately Internal Revenue Collector for Nebraska, and another gentleman started out hunting yesterday before the storm came on and have not been heard of since. It is feared they have been lost and frozen to death. W.B. Headley Frozen. Sioux City, Iowa, Jan. 13. – Special Telegram – W.B. Headley was frozen to death near Barkston, D.T. Found Frozen. Hitchcock, D.T., Jan. 13. Emil Gilbertson, formerly of Chicago, was found frozen to death two and a half miles west of here. He left Wednesday for his claim. A Nebraska Blizzard. When the recent blizzard struck the State of Nebraska the temperature fell so rapidly that the creek at Papillion was frozen solid in a few minutes. A calf that was in the stream at the time stuck fast before it could extricate itself. The animal was cut out with axes and thawed out before a bonfire. At last accounts it was doing well. Narrow Escapes. De Smet, D.T. Jan. 14. O.E. Stearns, teaching school six miles north of De Smet, with his three children were caught in a blizzard, and was out in the storm twenty-two hours. The boy had his feet frozen solid to the ankles. He walked a mile in this condition, and his feet then giving out he crawled half a mile to a house. He will loose [sic] both feet. N.E. Turner, living a mile from Westport, arrived in this city Thursday [Jan. 12] afternoon at 3 o’clock, having driven all the way through the storm with a team. When Mr. T. arrived here he was covered with one solid mass of ice. He wears a very long and heavy beard and the ice which completely covered his face was more than two inches thick. By continued exertion he kept the ice from freezing over his eyes, but the holes were very small and it was with considerable difficulty he could see at all. The story of his stormy ride is one full of dangers and trials, which were overcome by his wonderful display of nerve and good judgment…. Faulkton, Dak., Jan. 13. The most terrific storm ever witnessed in this latitude has been upon us for the last 48 hours. It reached its worst yesterday, and from 10 o’clock until dark there was not 10 minutes that buildings on the opposite of the street could be seen. The mercury gradually dropped from about 10 above to 16 below at dark last night. The teachers and most of the scholars of the two lower departments of our schools were compelled to remain in one of the schoolrooms all night, provisions being carried to them. Ropes were stretched from the corner of Main street to the schoolhouse to enable those carrying provisions to go and come with safety. 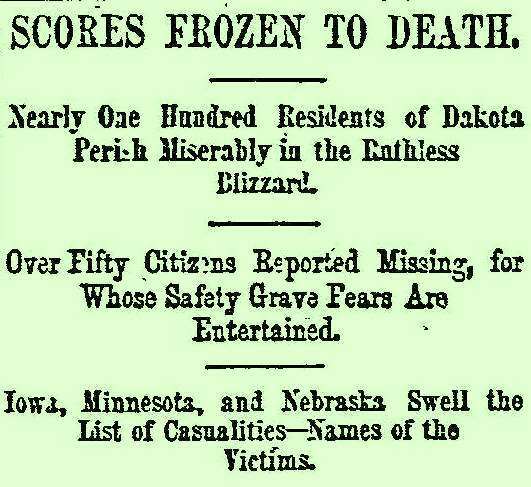 When the fast-moving Schoolhouse Blizzard of 1888 ceased on January 13, the death toll was 235. Travel in three states (Nebraska, Kansas, and Minnesota) and five territories (South Dakota, North Dakota, Montana, Wyoming, and Idaho) had almost completely ceased. But winter wasn’t over. On March 11, two months later, the East Coast from Maryland to Maine was paralyzed by the “Great Blizzard of 1888.” Also known as the Great White Hurricane, this storm—one of the worst in recorded U.S. history—left more than 400 more dead. For more information about Early American Newspapers, please contact readexmarketing@readex.com.